In 1942, the 1st Ranger Battalion was created after Major General Lucien Truscott convinced General George C. Marshall, the Army Chief of Staff, of the need for large, all-volunteer and highly-trained commando units that could be used for special operations. The Devil’s Brigade, also known as the 1st Special Service Force, was a Canadian-American unit trained in mountaineering, airborne, and close-combat skills that operated mostly in Italy and France. They excelled at close-quarters combat with numerically superior forces. At Monte la Difensa, Italy, they wiped out a strategic enemy defensive position high atop a mountain surrounded by steep cliffs. They got their nickname from a captured diary of a German officer who wrote about the American commandos whose faces were camouflaged in black paint for the nighttime raid, "The black devils are all around us every time we come into line and we never hear them." The 1st Ranger Battalion was named after their commander, Lieutenant Colonel William O. Darby. They first saw action during the invasion of North Africa, at the Battle of El Guettar, where U.S. forces handed the first solid defeat to legendary German General Erwin "The Desert Fox" Rommel. During the invasion of Sicily, Darby led his Rangers in an attack on the town of Gela. 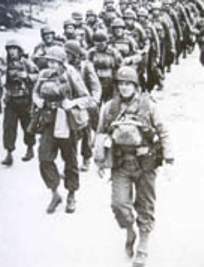 Darby’s men suffered heavy losses, including one platoon that was completely wiped out. During a counter-attack by Italian tanks, Darby and one of his captains took control of a captured anti-tank gun, knocking out several of the tanks and forcing the surrender of more than 200 Italian soldiers. The 2nd Ranger Battalion was commanded by Lieutenant Colonel James Earl Rudder and is best known as the unit that scaled the cliffs at Point du Hoc during the D-Day invasion. Their mission was to neutralize a battery of six 15mm coastal artillery pieces that were capable of hitting the Allied ships participating in the invasion. The Rangers hit the beach and immediately began scaling the cliffs with rope ladders while under constant rifle and machine gun fire from the Germans on the cliffs above. Once they made it to the top of the cliffs and eliminated the Germans they were shocked to see that Allied intelligence had been faulty. The guns had obviously been removed sometime prior to the invasion. Two hundred and twenty men attempted the climb up the cliffs. After the Germans were routed, only 90 Rangers were still battle-ready. Named after their leader, Brigadier General James Merrill, the 5037th Composite Unit (Provisional) operated in the Burmese jungle. The U.S. was supporting China by supplying them with war materials but when the Japanese occupied Burma they cut the land route to bring supplies into China. The Marauders’ mission was to pave the way for the construction of the Ledo Road, a connection between the Indian railway and the old Burma Road to China, and capture Myitkyina Airfield, the only all-weather landing strip in northern Burma. Merrill’s Marauders traveled over 1,000 miles in extremely dense jungle destroying Japanese supply lines, disrupting communications and defeating the Japanese in 35 separate engagements. Every member of the Marauders was awarded the Bronze Star.